﻿Published by Sareth Ney on Nov. 14, 2016 at 2:30 a.m.
OCALA, Fla. – Hollywood Fried’s inspiration to perform stand-up comedy took place after his wife had passed. Along with his great-nephew, he boarded a cruise. After gambling for some time, Fried asked his great-nephew what he would like to do. He replied he wanted to go see the comedy show they had. Fried granted his great-nephew’s request and they both attended the comedy show. Fried and his great-nephew attended the comedy show and thought it was funny. The following night, they saw the same comedian perform the same set and Fried remembered it was not as funny as the first time. On the third night, he saw the same comic perform the same material and he remembered it was not funny at all. On the fourth night, Fried approached the comedian and spoke of the experiences he had during the four performances. Fried advised the comedian he needed some new material. The comic replied he would have new material for his set, asked for Fried’s first name, requested his presence and he would have a reserved seat. As Fried remained seated—the comedian included him into his act, he did not expect it and he did not appreciate it. Afterwards, Fried told his great-nephew he could get on stage and could perform jokes. His nephew replied how talk was cheap. Fried took it as a challenge and he has performing stand-up comedy, for about four years. When Fried first performed stand-up comedy, he felt nervous. “Seinfeld” was Fried’s favorite sitcom. He enjoyed watching Larry David and Wanda Sykes, as well. His favorite sketch comedy show was “Saturday Night Live”, when it first aired 40 years ago. He stated he was surprised the creator, Lorne Michaels, was still alive. He mentioned some of the cast members which stood out including: Garrett Morris, Gilda Radner, Chevy Chase and John Belushi. 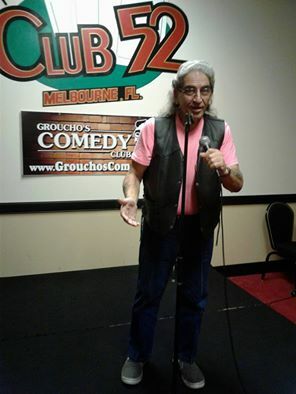 Fried’s cited his favorite comedy film was “Up In Smoke” starring Cheech Marin and Tommy Chong. If Fried could go on tour with any comedian, he chose Bruce Baum. If Fried could venture off into other forms of comedy, he chose public speaking. He mentioned he could do anything because he was “pretty verse”. ​Over the next five years, Fried hopes to become a featured and headlining comic. The experience he wants the audience to take with them is for them to laugh and applause. He states it is enough energy for him.